It’s Monday and it’s a new month! Happy Spring everyone. I hope you had a great weekend! I was very excited when I saw that Born Pretty Store was bringing out their own holo polishes. When I saw the swatches on For The Love Of Nail Art and Madness Nails I knew I had to have one. Of course I decided on #3, the pink holo polish. This was my first ever real holo polish and I love it. There isn’t really much else to say about this beauty except…Isn’t it gorgeous? I am so in love with this. I definitely need to get a few more. What do you think of this polish? Do you have any holo polishes and which are your favourite? My new fav holo polish is China Glaze DV8. Such a strong blue holo. I haven’t ordered from the born pretty store yet. How long does shipping take? This pink holo looks amazing on you though. 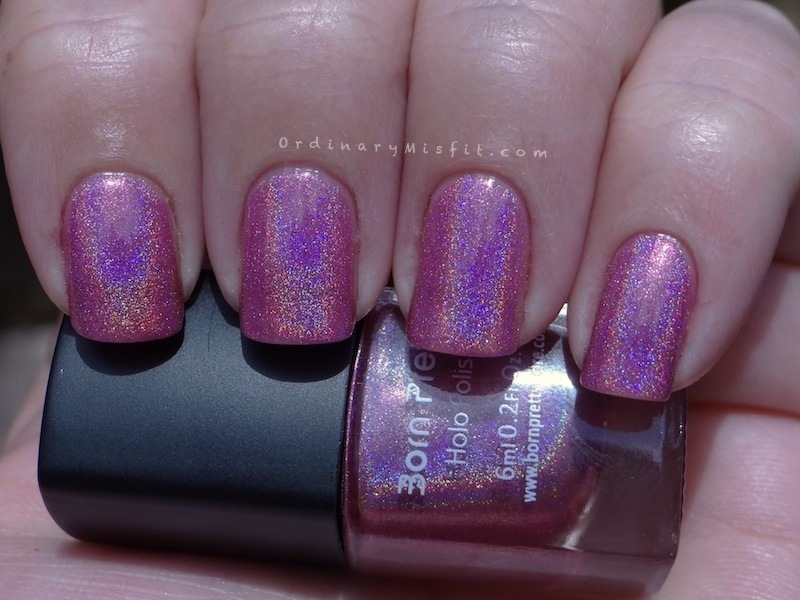 And what girl can resist some pink holo. I am lusting after DV8 so badly! I will definitely be getting it on my next shopping spree. Shipping takes about 2 weeks. It’s really not bad and consider the $3 shipping it’s well worth it. No I haven’t. My first order was just over R120 and the second was just over R360 and I didn’t have to pay any customs or taxes. I just paid the $3 shipping from them. Thanks Imka. I must tell you your nails are looking GORGEOUS lately!! OMW! I love this SO SO MUCH! Will try to remember if I ever place an order there. This is GORGEOUS!!! Ooooh, rainbow sparkliness! I like it! Except it’s pink…*whispers* you rock it though! GO M! Lol Love it! i think that this holo suits you perfectly! that’s what I think ok! Thanks V!! I LOVE it too!! I think I almost died when I seen this colour OMG I NEED IT NOW!! !